A delinquent account forces a number of costs onto the creditor. Employees spend time calling and writing the debtor attempting to collect. The creditor may be forced into delinquency on some of its bills, or fail to meet client demands. Then the creditor places the delinquent account with a debt collection law firm and may incur significant damages in the form of court costs, lost interest on the principle, and time lost. Finally, either by default or after a successful trial, the time to enter a judgment has arrived. Now, how much are you legally entitled to? California Civil Code Section 3287 is very clear: a creditor owed damages that are certain as to amount is entitled to interest. The calculation of the interest rate is more complicated, and I recently posted an article discussing what interest can be charged. Court costs, similarly, can be included in the judgment. However, this only includes costs paid to the court, such as the filing fee for the Complaint, and does not include collection costs, which are discussed below. 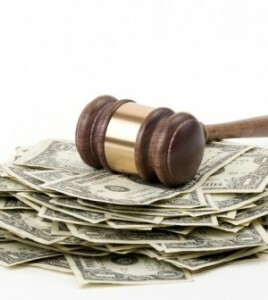 With few limited exceptions, attorneys fees can only be recovered if the credit application, contract, or other writing between the parties contains a provision for attorneys fees in the event of litigation. Otherwise, fees are either not available, or very limited. For example, California Civil Code Section 1717.5 allows attorneys fees to the prevailing party on any open book account… but limits those fees to, at most, $1,000. This, as well as the collection costs discussed below, is one reason you need a complete and thorough credit application, as discussed in another blog post. Other than these few areas, the damages available under California law for breach of contract are controlled by a complex patchwork of statutes and cases. Some types of transactions, such as real estate purchases, have many specific statutes and rules. As far as a standard collections claim, the operative sections are Civil Code Sections 3300, 3301, and 3358. Beyond these basic rules, it is a question of fact, and not law, whether damages can be recovered. This means that the judge or jury in each individual case will decide whether damages are “clearly ascertainable” or were “proximately caused” by the breach. There are, however, a few more areas where we have a more satisfying, or at least definite, answer. Can I Seek Penalties in my Lawsuit? The suing party is not entitled to any sort of penalty. As can be seen in the sections discussed above, the point of damages for breach of a contract is never to punish the breaching party. The only basis for damages is to make the suing party whole. It may not be readily apparent what a “penalty” is in the real world. Most often, it takes the form of a flat percentage of the invoice that is tacked on to the balance if paid late (“an additional charge of 15% of the outstanding balance shall be added to this invoice if it is not paid within 30 days,” for example). It may be called a “service fee” or a “collection charge” in the contract. The California Supreme Court itself has held that California will not enforce a contractual penalty, even when labeled something else: “But where it appears on the face of the contract that the sum named was intended by the parties to be considered as a penalty — a spur — courts will not enforce another construction, especially when the result would be the payment of a sum largely disproportionate to any reasonable idea of actual damage.” Muldoon v. Lynch (1885), 66 Cal. 536, 539. Liquidated Damages. California courts, in seeking to remain true to this basic tenet, currently generally analyze such flat fees, whether termed service or collection charges, or something else, under Civil Code Section 1671 as “liquidated damages”. Just as with the word “penalty”, the phrase “liquidated damages” has a special meaning in this context: it means an advance agreement by the parties regarding what the damages would be if there was a breach. Usually, damages can only be determined after a breach. However, Section 1671 allows the parties to agree to a measure of damages in advance. This section is very powerful for a creditor in a commercial setting, because the parties’ agreed damages are presumed valid, and the burden is shifted to the party who wishes to invalidate the provision. In a consumer setting, the amount of damages must either be impracticable or difficult to calculate in order for the damages to be enforceable. Collection Costs. Again, it is up to the court to decide in each case whether the collection costs were foreseeable enough to be included as contract damages. As noted above regarding penalties, California law does not allow the party to add a percentage to the bill as “collection costs”. However, collection costs can be a part of contract damages. This is clearly so when a contract, credit application, or other writing between the parties contains a provision allowing for the inclusion of collection costs. Even if this is so, the client should expect the court will require evidence of the actual damages, meaning, records of the time employees spent on the case, or a declaration of the actual time and costs involved. For both collection costs and attorney’s fees, it is important to properly draft and use a credit application. I discussed putting together a reliable credit application in another posting. Consequential Damages. But what about lost profits? Or what about the client you lost because your supplier failed to deliver? These fall squarely under the analysis provided above: the court will have to decide, on a case-by-case basis, whether the damages were proximately caused by the breach and were of the sort that would likely result from the breach. Conclusion. Whether a particular item of damage can be included in a collections judgment frequently depends on the thoroughness of the credit application or contract. Although you cannot collect a flat fee or other “penalty” under California law, you can collect actual damages, including collection costs. Beyond that, what damages are included is determined by the decision of the court in each case, and so experienced collection counsel is indispensible.